Your marketing team are doing a great job creating killer content and attracting traffic to your site; providing you with the perfect opportunity to sell to an engaged audience. But as we in sales know, you always need a final call to action to capture the lead. 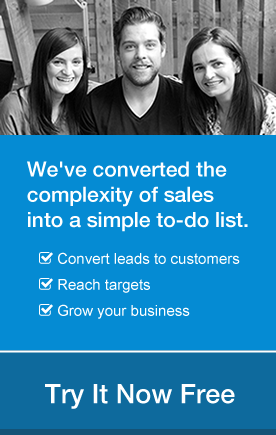 Here are 11 great ideas to turn marketings hard work into a captured sales lead for you. Our advice? 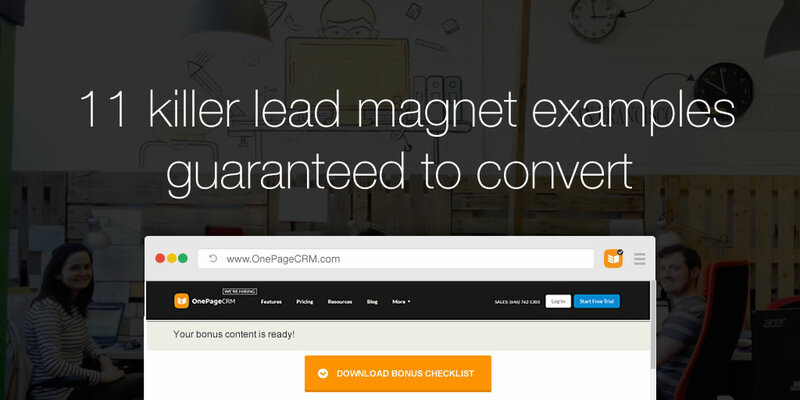 Create great content to first attract prospects to your website and convert them to leads by offering exclusive additional content behind an opt-in form. Create an additional piece of content that goes into more depth about some or all of the post. Offer this additional content behind a subscribe form. Minimum effort for maximum impact; this may seem like an odd one but it really works. Some people want to save your blog post to read it later, share it, or just want it in a different format. Create a .PDF by copying your blog post into an MS Word or Google doc and save/export as .PDF. From experience, readers are generally happy to hand over their contact details to download quality content in a convenient format. 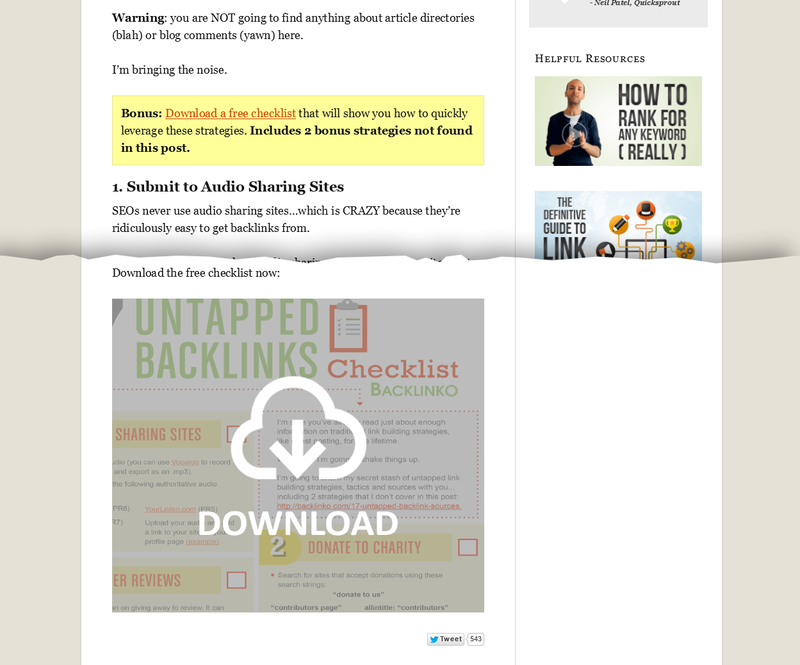 Re-formatting blog content into a handy, downloadable checklist is a simple, smart addition to any blog post. For example, if you just read a blog post on how to get people to link to your website, offer a checklist of the top 10 things to remember to do when asking for links. Brian Dean from Backlinko achieves a 5-8% subscription rate on his content (instead of a normal 1-2%) by offering a download focused on the blog post a person just read. His most common type of download is a checklist. It’s the classic storytelling advice, ‘Show, don’t tell’, and in an era of information overload, it’s never rang truer. Using screen capture software, record your screen as you demonstrate your blog post in more detail. Then, offer the video as a bonus to watch or download. No one’s expecting an epic hollywood production, so don’t worry if it’s not quite Tarantino. Record your guide in one take, a little rough and ready is fine, charming even! Start to finish, spend no more than 30 mins on this. 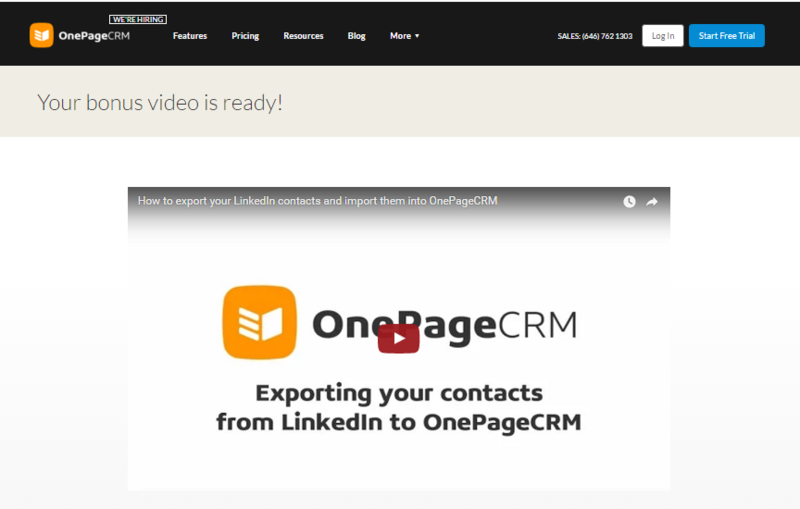 We added a quick video guide to a recent article, ‘How to export your LinkedIn contacts to a spreadsheet and import into OnePageCRM‘. The video received 75 opt-ins in 7 days. That’s 75 new leads in a week we would not have captured if we just offered the article alone. Bryan Harris of VideoFruit uses this tactic when doing how-to type blog posts. He shows readers how to do something; in this case it is how to upsell customers to a bigger offer. As part of that, readers need to setup one click purchase using their payment platform of choice. Bryan then searched for help guides from the main payment platforms on how to do that one thing and collected them together as a single bonus download. Bryan reports that this type of content upgrade converted 42% of all people that read it. The quickest way for a reader to get started after reading your blog post is if you provide them with all the tools necessary for implementation. 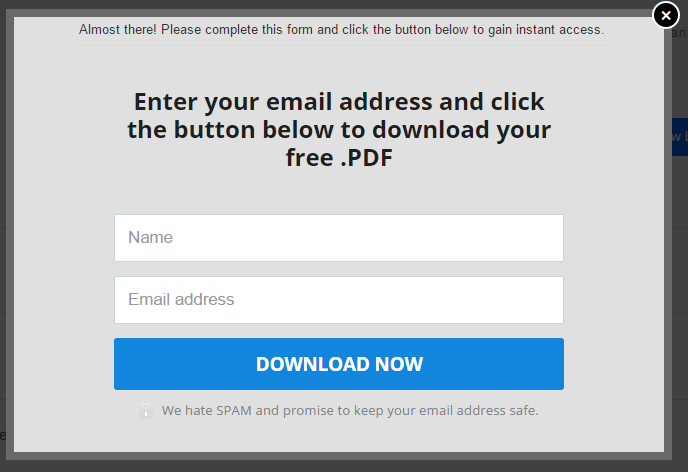 We’ve implemented this tactic with great success on a number of our posts, most recently, ‘’The cold email message that generates all our B2B leads’’ The content upgrade was a spreadsheet that contained the exact text of the cold email and follow up messages that a reader could simply copy and paste. It also included the text of a job description to hire a contractor to do the prospecting for you and a report template to track the success of the email. A swipe file or look book is a collection of proven examples for a reader to ‘swipe’ inspiration from. A great example of this is the email service providers like Mailchimp, Aweber and Constant Contact. Every Christmas, they do a series of posts in the run up to the holidays on how businesses can succeed. Along with these posts they provide a downloadable ebook of examples of past holiday campaigns that readers can take inspiration from. 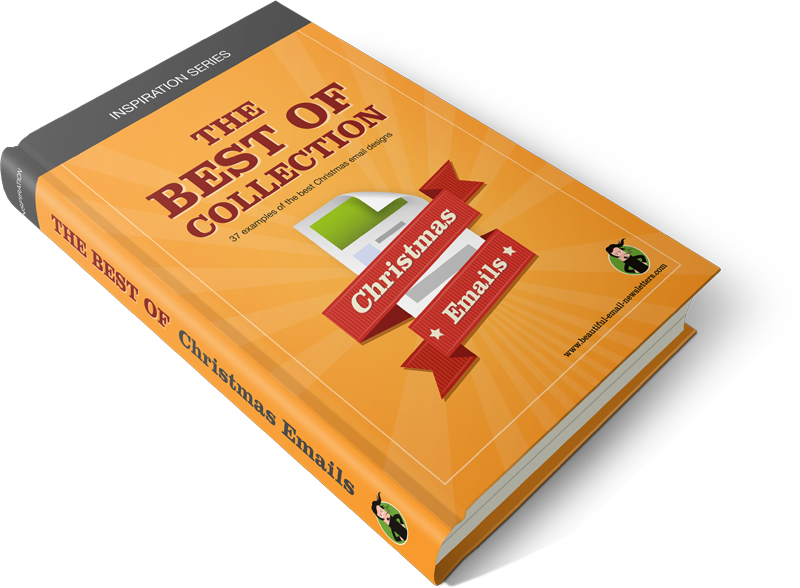 Check out BEN’s ‘Best of Christmas Emails’ swipe file for festive inspirations. If you fancy yourself as an expert, or have a considerable knowledge base on a specific subject, why not curate an eBook. How-to guides work particularly well. It can be small, about 6-7 pages, but it must cover the topic well. Big text and lots of pictures. You’ve invested your time, efforts and resources so offer it as exclusive content for subscribers only. 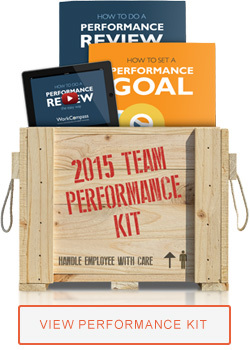 Engage leads by offering a recording/podcast of a recent webinar. A webinar is an excellent way to showcase the benefits of your product to potential customers. Or why not interview an industry expert on a topic your readers are interested in and provide a recording of the interview as bonus content? Check out Chris Penn‘s weekly marketing podcast, Marketing Over Coffee with John Wall for insights. Evaluate how strong of a lead the prospect is and how good a fit they are for your product using a survey. Try building a survey for your own industry or job role; ‘The top 10 skills needed to be a great X.’ Offer the survey at the end of the blog post behind an opt-in form and make the answers shareable for even further brand exposure.